Our screens are built on solid frames. No blower noise and capable of withstanding 15 mile an hour winds. 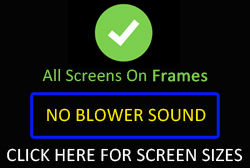 Click the video link to see our screen assembly.